The sugarcane harvester equipped with full-hydraulic drive.It can continuously and automatically complete the whole harvesting process of picking up fallen cane, topping,cutting, transmitting, truncating ,separating cane and top, loading with truck elevat. The purpose of the sugar Cane Harvester is to be able to harvest and top burnt sugar cane as well as un-burnt sugar cane. 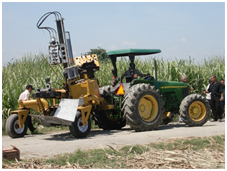 The sugar cane harvester is attached to any tractor by means of the two point tractor linkage. The sugar cane cutter was designed and built in South Africa. The cane cutting machines are easily disassembled and shipped to any country in the world. Sugarcane Harvester-vico usually is self-propel sugarcane harvester or capable to become tractors. It has functions of picking up fallen sugarcane, cutting and paving the stalk. Sugarcane harvester can adapt to different field forms. It can reap and pave sugarcanes neatly in various nature state such as fallen sugarcanes. Use advanced hydraulic control systems so that the machine can be adjusted according to different land conditions. With small size, light weight which makes the machine more flexible on the field. 0 Response to "Sugar Cane Harvester-vicro"